After making a couple of pretty intensively pieced tops (Made Ya Look at Blues and Triple Irish Delight) I was ready for an easy and quick one, so I made Frisky Boxes. It was number 9 in this series of upcycled blues. I've made some "box" quilts but this one is a bit more free spirited. That's why I called it Frisky Boxes. If you've spent time over at the free patterns page, you will find Fancy Squares and Framed - sort of similar but different. It's pretty long. 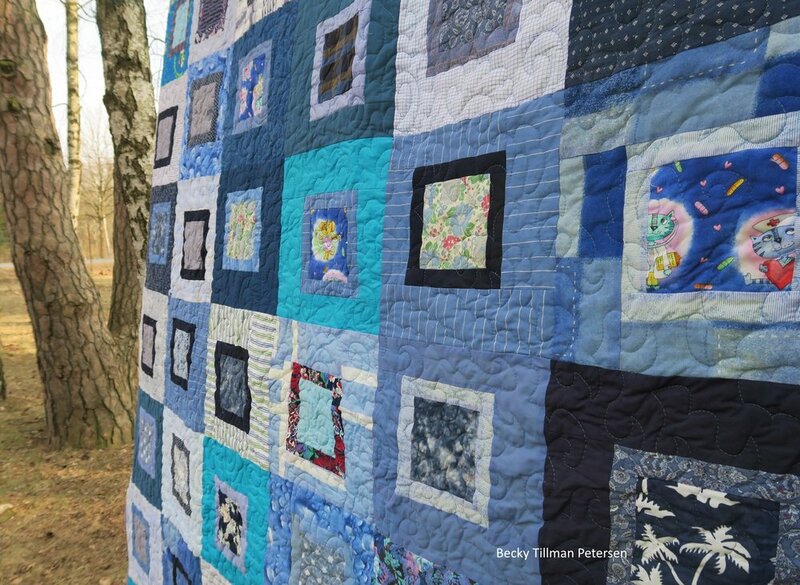 When you see a quilt touching the ground when it's outside on the line, you know it's hitting close to the 100" mark. I did a kind of free form quilting - trying to work on curls and such. The very fact I did it is progress in my desire to expand my FMQ horizons. The backing - an upcycled duvet cover - from Ikea. Of course I bought it at a second-hand shop - but it was originally from Ikea. I like it! When I placed the boxes, I tried to mix up light and dark and then flip them around. Sometimes when I finish, it looks like I didn't do a good job mixing it up, but I really did spread them all out on the floor (my design board) and moved them around and around, flipped and turned until I thought they were right. Then I got it together and saw a few places I could have improved upon. But that's how it seems to go with these types of quilts. It's not the first time. Sometimes you just have to call a halt to the rearranging of the blocks and start putting them together! I took these pictures a week or so ago. The snow is gone and has been gone for a little while now. I think it looks cool from a distance. It's a simple quilt and could be finished in a couple of days if you put your mind to it - and don't have a lot of distractions. I did update the free pattern with new pictures. It is here. I hope some of you can use it! Don't forget - my sis has a lot of interesting things in the store! Be sure to check it out while you're here! Backing is one of the things she features at a great price!